David Leslie Stapelton played entire seven-year major-league career with the Boston Red Sox. 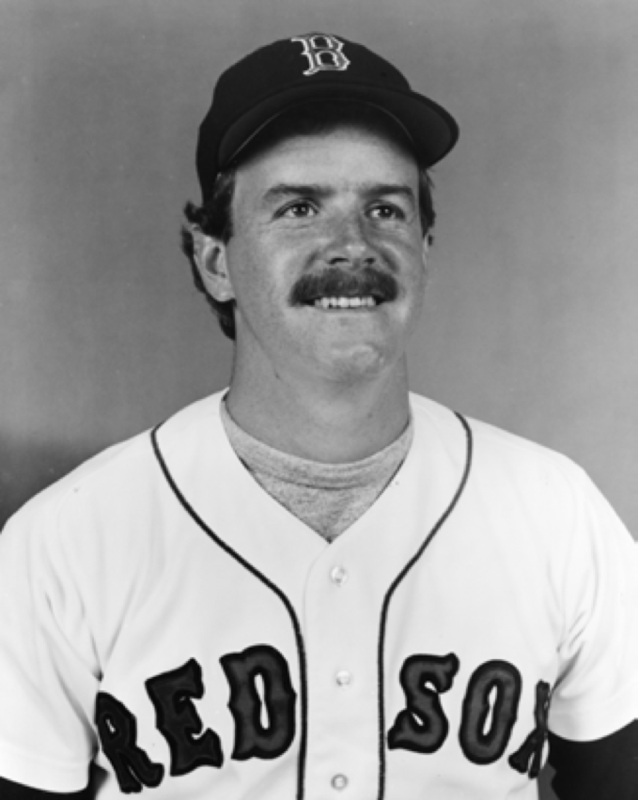 An infielder and renowned utilityman, Stapleton made his lone World Series appearance as a member of the 1986 American League Champion Red Sox. A 6-foot-1, 180-pound second baseman, Stapleton smacked 39 doubles in his collegiate days for the University of South Alabama Jaguars.2 Before starting for the Jaguars, he played two years at Faulkner Union, a junior college. He attended Robertsdale High School, a private institution. Stapleton led the Jaguars in RBIs (69) during the 1975 NCAA Division I season and was named to the university’s athletic Hall of Fame in 1993. The Red Sox drafted right-hander Stapleton in the 10th round of the 1975 amateur draft. Playing for the Winter Haven Red Sox in the Single-A Florida State League in 1975, Stapleton hit .241 with just 10 extra-base hits in 56 games played. He batted .288 the following year in Winter Haven, meriting a promotion to Double-A Bristol for the start of the 1977 season. Stapleton led the Bristol Red Sox with a .306 batting average in 86 games before his elevation near the end of the season to Pawtucket, where he hit .243 in 25 contests. He spent two seasons in Pawtucket, improving his average from .259 in 1978 to .306 with 15 homes and 64 RBIs in 1979, figures that earned him the International League MVP award. After Stapleton’s torrid start to the 1980 season — a .340 batting average with three home runs and 19 RBIs in 37 contests — he was promoted to the Red Sox at the end of May. Appearing in his first major-league game on May 30, 1980, at Fenway Park, Stapleton went 1-for-4 against the Milwaukee Brewers. He recorded his first career hit in his third at-bat, doubling off Lary Sorensen to begin the bottom of the fifth inning. John Flinn entered the game for the Brewers and Stapleton advanced to third on a groundout by Carl Yastrzemski, then scored his first career run on a sacrifice fly hit by teammate Tony Perez. The Red Sox won the contest 5-3. A season-ending knee injury to Jerry Remy — who underwent the first of five operations on his knee in 1980 — opened the door for Stapleton to be a full-time starter with the Red Sox.3 Stapleton took advantage of the opportunity, and had the best season of his career in his rookie year. He registered a .321 /.338 /.463 batting line and bashed 33 doubles in 106 games. Stapleton finished second in the American League Rookie of the Year voting behind Cleveland Indians outfielder Joe Charboneau. Unable to replicate his rookie success in 1981, Stapleton lost the starting second baseman duties to Remy, who hit .307 in his return to action in 1981. Stapleton batted .285 — the start of a trend that saw his batting average drop each season for the remainder of his career. No longer the everyday second baseman, Stapleton began his role as a utility player, starting at various infield positions. As of 2015, he was one of 19 major leaguers to start at least 12 games in a season at first base, second base, third base, and shortstop — a feat he accomplished in 1981. Stapleton overtook Tony Perez for the starting firstbaseman job in 1982. His numbers continued to dip, as he posted a .264 /.305 /.398 slash line. He kept the starting duties the following season, hitting .247 with 31 doubles in 151 games played. That season proved to be Stapleton’s final as a starter. He appeared in just 82 games in the last three seasons (1984-86) of his career. The final regular-season game of Stapleton’s career came on October 5, 1986, at Fenway Park against the New York Yankees. Stapleton entered the contest in the top of the eighth inning as a defensive replacement at second base for Marty Barrett. His lone at-bat came in the bottom of the ninth against the Yankees’ Scott Nielsen, who pitched a 7-0 shutout and retired Stapleton on a groundout to third base. In the final season of his career, Stapleton was primarily used as a defensive replacement. In particular, he often relieved first baseman Bill Buckner, who endured constant pain in his legs (particularly chronic ankle issues) throughout the 1986 season.4 Red Sox manager John McNamara used Stapleton at the end of all seven of Boston’s postseason victories in 1986.5 Yet with the Red Sox leading the New York Mets, 5-3 (and holding a 3-2 series advantage) in Game Six of the World Series, McNamara opted not to sub in Stapleton for Buckner in the bottom of the 10th inning. This error in judgment saw the Mets complete their improbable three-run rally with a Mookie Wilson groundball through the legs of Buckner. Buckner’s error completed the comeback for the Mets, who went on to win Game Seven and capture their second World Series title. Rumors swirled that McNamara kept Buckner in the game because he felt his first baseman deserved to be on the field when the Red Sox got the final out to clinch the championship. McNamara disputed that claim in a 2011 interview on MLB Network, which was celebrating the 25-year anniversary of the classic Mets-Red Sox World Series. Stapleton final major-league action came in Boston’s 4-2 triumph in Game Five on October 23 at Fenway Park, as a defensive replacement for none other than Bill Buckner in the top of the ninth inning. Stapleton’s career had seemed destined to last a decadeplus, but he was finished after seven seasons. He was released by the Red Sox after the 1986 season. He signed with the Seattle Mariners on December 23, but was cut by the team just before the 1987 season. Stapleton fathered three children (Shaun, Joshua, Cara) with his wife, Cheryl, a former New England Patriots cheerleader and a lifelong Red Sox fan.10 Shaun, the oldest child, graduated from Auburn University and as of 2015 worked as a project manager for a road-building company. The middle child, Joshua, played college baseball at his father’s alma mater in his freshman year before transferring to Auburn University, where he started games from 2006 to 2008 at designated hitter, third base, and right field.11 In 2015 he owned the Josh Stapleton State Farm Agency, in Cartersville, Georgia. Cara, a graduate of the University of Mississippi, was an event planner in Washington, D.C.
1. Author interview with Dave Stapleton, July 21, 2015. 3. “Evans Has Surgery,” Victoria Advocate, November 1, 1984. Retrieved from news.google.com/newspapers?nid=861&dat=1984 1101&id=Xi1JAAAAIBAJ&sjid=ln8MAAAAIBAJ&pg=4732,411 010&safe=strict&hl=en.